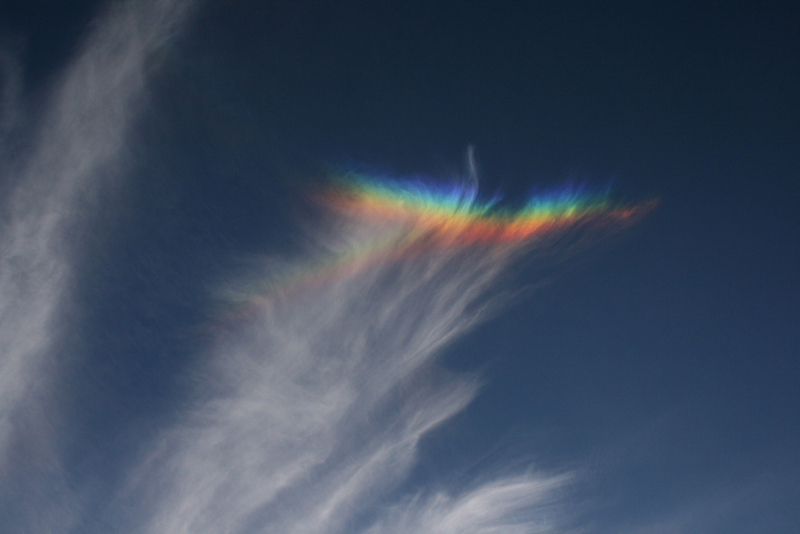 The photo above, snapped in Gulf Breeze, Florida on a chilly February afternoon, shows a colorful circumzenithal arc (CZA) and a much less frequently observed (and somewhat dimmer) lateral arc just beneath it. The camera is facing, but aimed well above, the Sun. Gauzy cirrus clouds composed of hexagonal plate-shaped ice crystals filled a good portion of the western quadrant of the sky. CZA’s take shape when sunlight enters the crystals’ upper basal faces and exits through one of the six vertical side faces. e horizontally oriented and for the brightest colors, they have to be precisely aligned. Additionally, the Sun must be lower than about 32 degrees above the horizon in order for these jaunty arcs to form. The dimmer arc is a portion of the 46 degree halo. It’s formed by light passing through the 90 degree prism of small, randomly oriented crystals. Note the faint arc below and to the right of the CZA. This is part of an upper tangent arc produced when light passes through large, spinning hexagonal crystals. See simulation at left -- the approximate part of the photo above is within the frame. Be sure to protect your eyes when looking toward the Sun. Photo taken on February 13 at approximately 4:30 p.m.
Photo Details: Camera Maker: Canon; Camera Model: Canon EOS DIGITAL REBEL XTi; Focal Length: 18mm; Aperture: f/9.0; Exposure Time: 0.0040 s (1/250); ISO equiv: 400; Software: Microsoft Windows Photo Gallery 6.0.6001.18000.